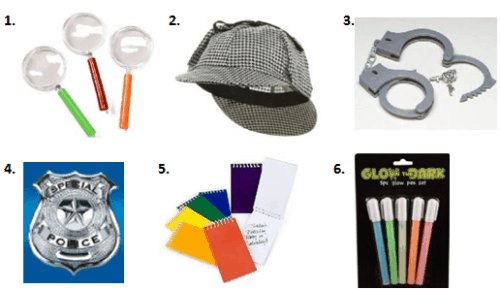 One of the coolest birthday parties you can plan is a secret clue mystery party. These mystery party ideas are sure to keep the guests entertained & using their problem solving skills. Here you’ll find ideas for invitations, decorations, lots of activity ideas, food & treat bags. For even more mystery party ideas, check out our special Mystery category. There are so many fun ideas for mystery party games. First you’ll have to think of a mystery you want the guests to solve. Perhaps the birthday cake has went missing…maybe the presents have vanished…maybe a favorite stuffed animal is lost. Use your imagination and try to think of something fun for the guests to solve. riddles (click here for some fun riddles for kids) like “What has two hands & a face but no arms or legs? A Clock!”. Your clues could point to different areas around the house like “Where could you go to look back at some old memories?” which could lead them to a photo album shelf. 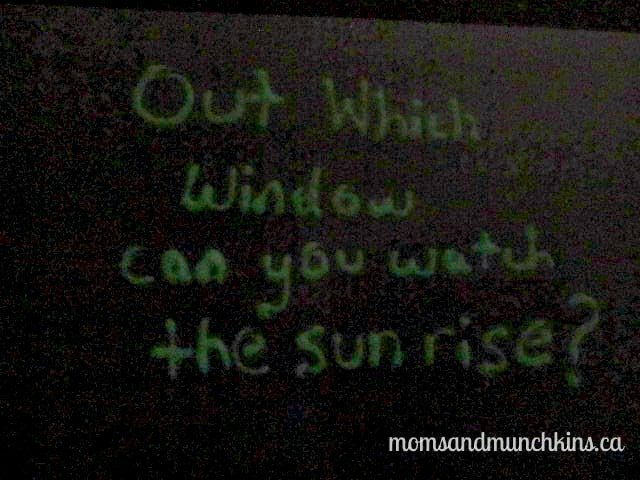 Another example around the house is “Out which window can you watch the sun rise?” and then guests have to find the right window in order to find the next clue. Quote a line from one of your children’s favorite books, movies or CD’s and hide the next clue inside the book, movie case or CD case. Maps or instructions like “Take 5 steps forward, 3 steps right, 10 steps left, 7 steps forward”, etc. Your mystery party clues can include several different challenges. Here are some fun mystery party ideas you may want to incorporate into your party. Mixed Messages: Create a backwards message that must be read in a mirror in order to read. You can do this in MS Word by using the WordArt tool. Type in your message into the WordArt box and click on OK. Next click on “Flip Horizontal” in order to create a mirror message. Glow In The Dark Messages: Using glow in the dark ink, create a secret message and hide it in a dark room for the guests to find. Their clue should read something like “Are you afraid of the dark?” so they know to keep the lights in the room off. 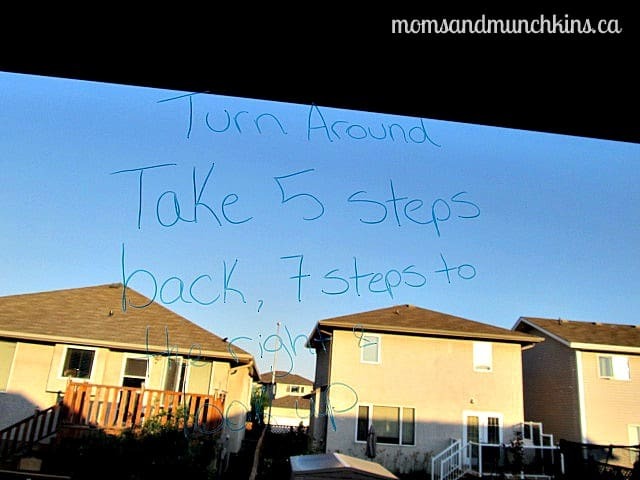 Window Message: Using special window markers, leave a message on a window (behind the blinds) for the guests to discover. Follow The String: Using a large ball of string, tie one end to the start of the clue area and then wind it around through different rooms of the house, in and around furniture, etc. The guests will have to follow the string in order to discover the next clue. 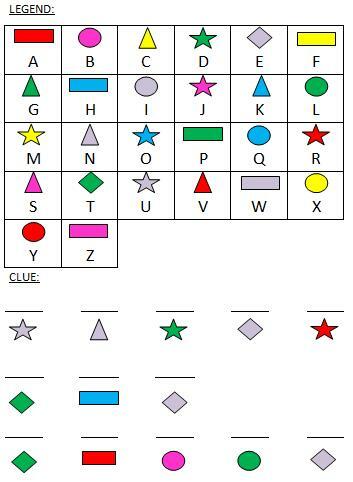 Picture Puzzle: Create a legend of shapes and letters (example, A is a red circle) and then a clue with only shapes. The players will have to use the legend to solve the clue puzzle. You can print this legend and clue for free (the answer is “Under The Table”). Obstacle Course: Create an obstacle course that the children must each complete before earning the next clue. Here are some fun obstacle course ideas. Hidden Treasure Idea #1: This is a messy challenge but it would be a lot of fun for the guests. Bake cupcakes and then hide a clue inside one (wrap it in plastic so it doesn’t get smudged) and then ice all of the cupcakes. The guests must dig through the cupcakes in order to find the next clue. Hidden Treasure Idea #2: This is a bit less messy than the previous idea, hide a clue inside a balloon. Fill an area with a lot of balloons and have the kids pop the balloons until they find the one with the clue inside. Tiny Messages: Print off a message printed so tiny that you need to use a magnifying glass to read it. Follow The Footprints: Cut out large foot prints (you can just trace a shoe for this) and leave a trail of footprints for the guests to follow in order to find their next clue. Your final clue will lead to the missing object (like the missing cake or presents). Any type of food can easily fit into a party theme with some fun names & labels for the food. If you are hiding a special clue inside of a cupcake for the activities portion of the party, these cupcakes could also be the dessert for your party. Want to make your own mystery themed cake? 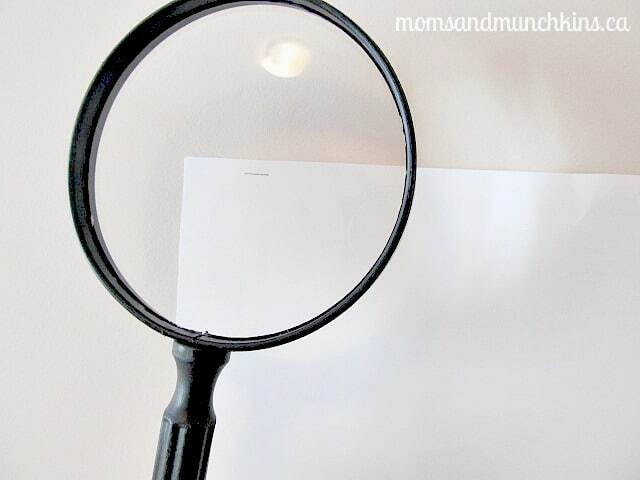 Here are instructions on how to make a magnifying glass cake. What do you think a good mystery to solve at a party would be? We have so many more fun birthday party ideas to share with you. Follow us on Facebook, Twitter, Pinterest and Bloglovin’ for the latest party ideas. **Disclosure: I am part of the Amazon & Birthday in a Box affiliate programs. All opinions expressed here are 100% my own. I love this idea, it would be so much fun for all ages! Thanks for sharing and thanks again for the awesome party set up you made with my 4th of July printables!